A journal published by the Ecological Society (ECOS) of Nepal. 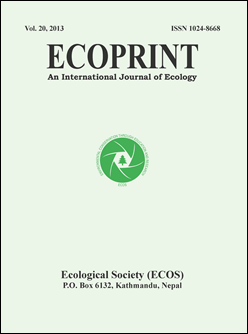 Ecoprint is published by the Ecological Society (ECOS) and contains articles related to ecology and the environment. Full text articles now available. Established by INASP in 2007. Managed by Tribhuvan University Central Library. Nepal Journals Online (NepJOL) is a service to provide online publication of Nepalese journals. For more information about NepJOL and how to join the service, see the About page.